This is a bit of gem for those of us who like a big tasting winter whisky with no heavy peat or smoke, allow it to open a little to reveal a whole range of flavours. Palate: Even more rich fruity noted than the nose suggests, quite a bit of spice with citrus notes of sweet rich satsumas and ripe sweet pears. A lot of activity across the whole palate with this dram. Finish: The finish takes us back to the nose as more cherries and then fruit in syrup coats the back of the palate leading to a hit of hot spices with cardamon and cumin. Sadly I was unable to attend the final tasting of the Water Of Life Society in 2014 due to work commitments taking me to Brighton for the week. During this tasting the WOLS presented their fantabulous Awards and also partook of some fantastic drams, this being one of them. 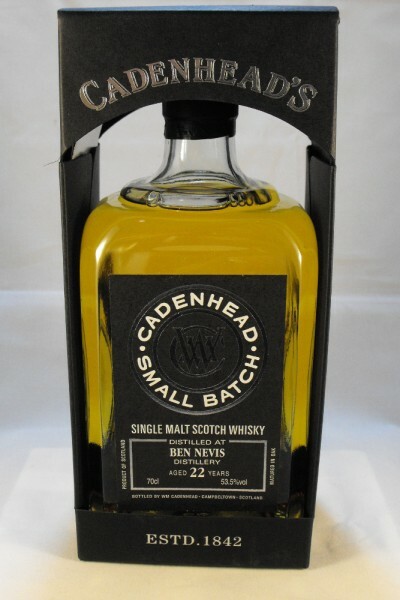 Another unusual and interesting dram from the Ben Nevis distillery. I would agree with the official notes here, this one really does work across the whole range of the palate and seems to keep shifting the more you dram. One thing I really liked was the moreish drying (white wine) quality that cleansed you palate, making you forget what you had just tasted and go straight back for more. I kept looking and I’m sure there was something missing within this whisky but couldn’t find out what? Enigmatic sums it up – a little like catching a glimpse of the summit of (the distillery’s namesake) the mountain Ben Nevis on a typically Scottish weather-filled day!